VBOX Test Suite is our next generation analysis software which has replaced VBOX Tools in many test facilities. If you haven't tried it yet, please do! We have created nine short tutorials to give you an overview of the main features and a basic understanding of how to use it. We are pleased to offer a new pedal force sensor (RLACS282) that is ideal for Brake tests such as SAE J2909, as well as measuring pedal force. Supplied with a universal mounting bracket and made from steel, the sensor has a low profile design with a large, anti-slip contact area and can also be used with a brake pedal trigger. Today we have releasing a new firmware version for the Multi-Function Display (MFD). Version 13.09 resolves several stability issues and incorporates the fixes made in the 13.06 BETA release to achieve a closer match of the Pass-By Noise acceleration calculation to the Regulation 51 calculation formula. Fixed issue where MFD could freeze when running at 1 M/Bit Baud rate while connected to Can Hub. Fixed issue where random characters could be displayed when MFD 'beep' action is triggered. Changes made to Pass-By Noise acceleration calculation to ensure closer match to Regulation 51 calculation formula. Additional parameter for Pass by Noise test. Mid-point to end accel for fixed gear transmissions in R51 regulation. VBOX 3i Firmware version 2.6 comes equipped with a new 3 Target ADAS mode, improved Robot Navigation and uninterrupted Slip Angle calculation, even in areas with low GPS coverage. The latest VBOX 3i firmware (v2.6) enables engineers to log positional and time-to-collision data from up to 3 moving targets and a lane simultaneously, allowing them to meet the guidelines set out by the new Lane Change Test for ACSF (Automatically Commanded Steering Function). Firmware version 2.6 comes equipped with a new ‘SlipHead’ channel which does not require a valid dual antenna lock to achieve accurate Slip angle measurements. A useful tool on test tracks where GPS coverage is hampered by bridges, buildings or nearby trees. Racelogic have also improved the heading channel which is used for ADAS calculations and Robot Navigation by introducing a ‘RobotHead’ channel. By using this channel, you should now benefit from cleaner ADAS signals as well as reduced noise in the robot navigation heading signal. The layout of the VBOX Manager has also been revamped, simplifying the menu structure and making the current settings more visible. As a result, both the VBOX 3i and VBOX Manager firmware will need to be updated to benefit from these new features. Today we’ve released a new version of VBOX Test Suite, 1.7.55.2453. This release adds R117 Pass-By Noise for tyres (beta), removes the beta tag for R138 PbN & R78 Braking, adds Chinese & Japanese as a language option and contains multiple changes/fixes. For a further list, please see the history notes. VBOX Test Suite should notify you that an update is available. We will be there to support you, and to demonstrate our new products and software. You’ll be able to take an exclusive look at our exciting new data logger, the VBOX Touch, with its bright capacitive touch screen and varied programming options. We’ll be demonstrating VBOX Connect – a real-time vehicle position monitoring and file-download system. We have several new software plugins for VBOX Test Suite, such as Pass By Noise and AEB. See how we can save you time and cost in your test and development programs with software designed specifically for your requirements. We will also be able to show you our prototype indoor positioning system. Come along the VBOX Roadshow to discuss your testing needs both now and in the future! We will be delighted to welcome you into the VBOX hospitality trailer for refreshments during the day, as well spending time on the test track for demonstrations. Please email with the date and location you'd like to attend, so you can receive more detailed information on the event. We have released a new version of VBOX Test Suite. Version 1.7.13.2107 adds two test plugins, additional features such as Interim results and several bug fixes. For a full list, please see the history notes which summarises the many changes/fixes since the previous release. As with our other recently updated applications, VBOX Test Suite now uses .NET Framework 4.7.1, meaning that Windows 7 SP1 or later is now required to run it. The latest version includes Interim Results (formerly known as "Line Conditions") which allows any channel to be used as a condition, as well as adding a 'between' condition to the 'at' and 'every' conditions. This addditional functionality allows for Interim Results to now be included in the main results table or, as previously, as a separate table. 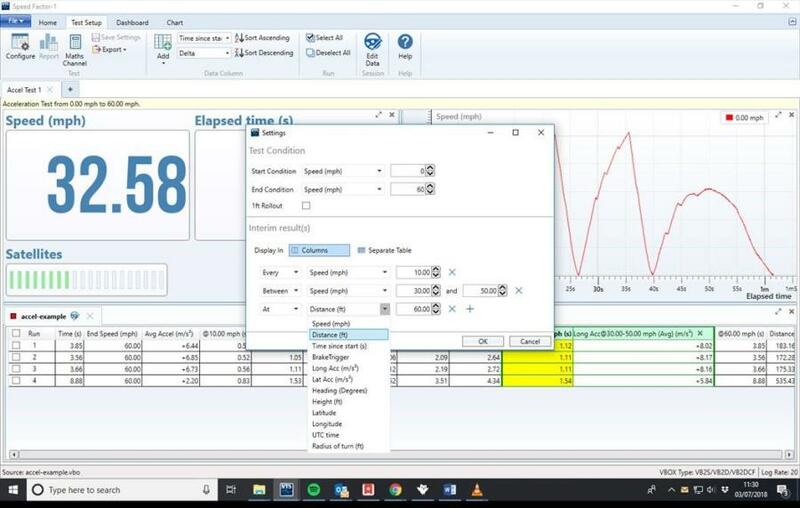 When Interim Results are included in the main table of results, average/min/max/standard deviation parameters are accessible on multi-run sessions; which makes for easier export to custom-presented results in third-party software or further processing. The software allows the user to display intermediary results called ‘Interim results’. The Interim results are determined by adding in ‘Interim Conditions’. Interim Results are determined from within a plugin configuration window. Pressing the '+' button will add a new interim result. It is possible to have this line appear at ‘Every’ instance of the value (i.e. Every 10 km/h), ‘At’ an instance of a value (i.e. Only at 10 km/h) or 'Between' values (i.e. Between 30 km/h and 50 km/h). 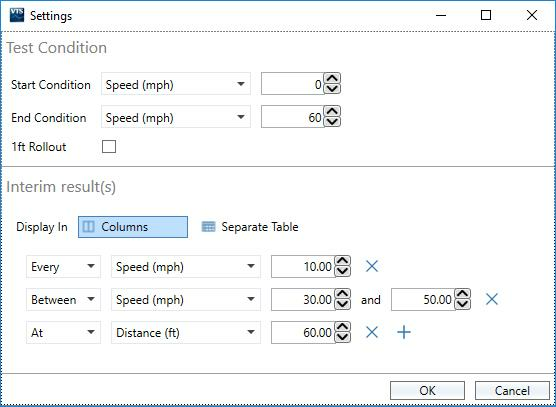 When 'Columns' is selected, each interim result is shown as a column within the right hand side of the results table, if 'Separate Table' is selected, each interim result is shown as a row, in a separate table, next to the results table. If you need to record when an ADAS system has become active without using the vehicles' own CAN system, an AVAD3 audio & visual detector from DTC Solutions can now be used alongside VBOX. AVAD3 is capturing acoustic and optical alerts and signals generated by the vehicle's advanced driver assistance system. It produces a CAN or digital signal when recognising changes of the shapes and colors of defined icons or when audible signals are identified. The output of the AVAD3 can then be used by the VBOX to log the exact moment the vehicle safety message is displayed to the driver. Ideal when testing the accuracy of advance driver assistance systems. Fix to header file for Static point reference lane. To fully configure a VBOX 3i running this firmware, VBOX Setup 2.1.21.546 is needed. An update to VBOX Test Suite software that allows test drivers to accurately follow a prescribed path during testing is now available. The Path-Follow feature within VBOX Test Suite has been developed as a result of VBOX customer requirements to achieve greater levels of testing consistency. When conducting wet braking tests, for instance, inconsistencies in track surfaces (perhaps as a result of certain areas becoming ‘polished’) can lead to less consistent braking distance measurements. It therefore becomes vital that tests are conducted in exactly the same area, but this is difficult to achieve without guidance for the driver. Indeed, it can be very difficult to drive on the same piece of tarmac in manoeuvres such as clock wise and counter clockwise roll gradient tests without using a steering robot – incurring significant time and financial overheads. The Test Suite software predicts the path that the driver should take by using an algorithm which includes speed and heading prediction. It is challenging for drivers to follow a live and immediate guidance accurately, so the prediction aspect of the algorithm ‘soaks up’ the latency of human actions at the wheel and the mechanical response of the vehicle. This cancels out any oscillations in driven line that occur when attempting to drive in such a precise manner: the VBTS software offers this predictive guidance in a number of display options to accommodate driver preference.